Yesterday, I was asked a few questions in regards to the soy tarts I created. (Read about my soy tarts.) I was simply going to reply in the comment box but I felt it would make a good post. I am not an expert on soy candles nor do I claim to be. I'm just sharing information that I have found and learned along the way. Our experience shows the soy wax gets worse with age, i.e. frosting & separation from the glass, & sometimes discoloration. How do you get yours to get better with age? We use GD440 soy wax & pour at about 150 - never poured when slushy - is this just for your tarts or do you pour slushy for all candle types? Welcome to the joys of soy. No really, soy wax is full of all sorts of fun. One of the aspects of soy is that it does frost and separate a bit from containers. That is the nature of the beast. The frosting is caused by the wax cooling off after it has been poured. A heat gun to the top will not help, it will make it worse. (Ask me how I know and never attempted it again.) There are other brands of soy that have additives in them to help with the frosting and separation. 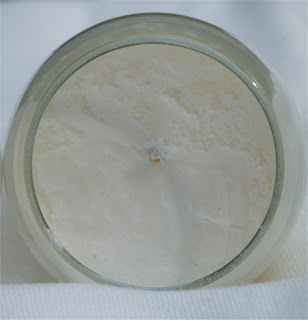 Candle Science is just one of many a sites you can check out to see the various soy waxes. Discoloration can be caused by light exposure (this also happens in M&P soaps if exposed to direct sunlight for a long period of time) or simply over time being absorbed into the wax. They do sell a UV color stabilizer that helps with this; I have never used it though but know of others who have great success with it. Now, I have read in a few places that liquid candle dyes can cause more flaking in soy. I tinkered with color chips specifically for soy and never had an issue of increased flaking nor discoloration. I have to admit to never hearing of the wax you stated, so I am not sure what the mfg recommends. Each wax has different melt points, pouring temps and max load of fragrance oil. What works with one does wax not work with all. You may want to try and let your wax cool a bit more before you pour it. Say 125 degrees, just a suggestion not sure if it will help or not. As stated in my soy tart post, I use GB 415 soy wax, it is just straight soy. I tried it (GB415) about eight years ago and had wonderful success with it. I stopped making candles for a few years. Then last year, I wanted to make them again and try a new wax. I went with Cargill C-3 and this wax (for me) was a bit more temperamental than what I wanted to work with. I went back to the GB415 and picked right up from where I had left off. With the GB 415, I heat it to 160 degrees; add fragrance around 125, let cool again until slushy (around 95 degrees). Once it hits the slushy stage (around 95 degrees), I will pour the wax. That is it, nothing fancy thrown in. Just my needing to be patient and not rush the process. I do not make many container candles but those that I have using this method are just fine. They did not separate from the container and the frosting was not too horrible. This candle was made last October- it is super strong and notice it does have some flaking on top. I hope this helped you out. Again, in no way am I an expert on soy wax and if anyone has any other helpful tips please chime in. Check out the CraftServer forum (if you have not already). There you will find a wealth of information and I am sure the people there can help you out even further. One Item I cannot stress enough is that you must test your candles & tarts each and every time you make them. Try to do small test batches and always remember to make notes! Make sure to include what type of wax, when you poured (temp), size of wick, size of container, how much fo, then list what happened as it burned. These notes will become your best friend as you work with any type of wax. Um.. is anyone still awake after this post?! Wow, Iron Man Movie, Wow!! !